Coming June 3, 2017. It’s Swim Defiance…not defiance as is bold disobedience, but Defiance as in Point Defiance, an area in Tacoma, Washington. But you will need a little (or maybe a lot!) of boldness to complete this 5K open swim in the chilly waters of Commencement Bay. 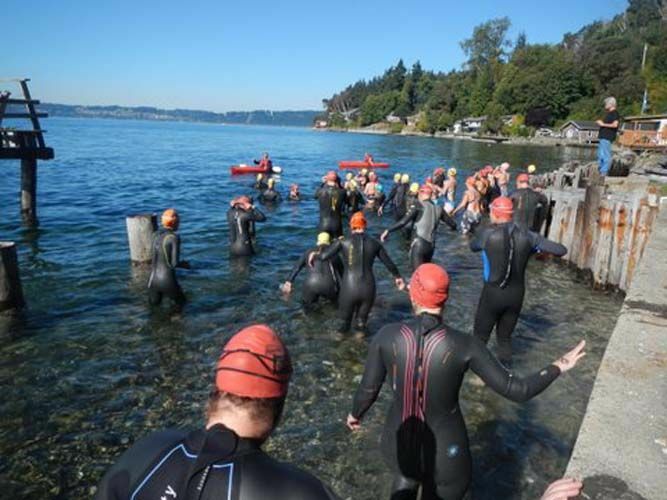 (Water temp is estimated at 56-60 degrees F.) The course is an out and back, triangle from the waters off of Owens Beach to Vashon Island. Safety is paramount as racers are require to wear a personal brightly colored safety buoy, color-coded race cap, and race chip as lifeguards, kayaks and water rescue and safety boats monitor the course. There’s also a 3K length – one way from Vashon to Owens Beach. So be defiant and check out the fourth annual Swim Defiance!